Published: Jun 18, 2014 to ? At Kamome Academy, rumors abound about the school's Seven Mysteries, one of which is Hanako-san. Said to occupy the third stall of the third floor girls' bathroom in the old school building, Hanako-san grants any wish when summoned. Nene Yashiro, an occult-loving high school girl who dreams of romance, ventures into this haunted bathroom...but the Hanako-san she meets there is nothing like she imagined! Kamome Academy's Hanako-san...is a boy! 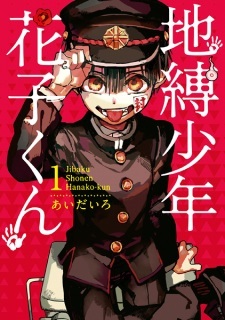 Jibaku Shounen Hanako-kun has been published digitally in English as Toilet-Bound Hanako-kun by Yen Press since August 29, 2017. Want a fun, compelling story to binge on? Want to enjoy eye pleasing art you can stare at all day? Want to see a good mix of character development and relatability? Want to enjoy every frame and panel in this manga? Well, if so, I recommend taking a peek at this manga because personally, all of this criteria has fulfilled me. To me, this story is original in my opinion. Although the idea of having a supernatural partner is an old concept, the way the author molds that cliche into her own special thing in a school setting with little adventures involving supernatural school rumors, is astounding. She takes the story of what many might know as Bloody Mary and turns it into a whole school-wide adventure that I know I've had imaginations of as a child but I have never seen anybody build it into a compelling story. I don't know about you, but I felt loads of different emotions while reading this and I hope you do too. The art is a cutesy loli kind of style that I usually do not like in my manga. But, this is an exception. It absolutely captures the innocence of the characters yet it also turns the cute to creepy when needed. The landscape and all of the scenery are crisp and vivid even though it is just black and white. You guys should experience the art yourselves, since everybody's tastes are different, but make sure to try it out! Overall enjoyment? AMAZING! I literally did not do anything but read it the whole day (it was winter break D:: no judge plzz ;-;) because the story was so entertaining to read. A lot of the time I was like AHHHHH and WOAHH and PRECIOUSSSSSS and ANFJA VHLF;MCKD,SZAN XSBC. Yeah, maybe I'm just too emotional. I guess this part is up to you guys to decide if you enjoy it or not as well, we all have different preferences. It might be a bit unrealistic to score all aspects a 10/10.. ahehe, but perhaps it was because I haven't read something so compelling to me in so long, but honestly, give it a try! Hopefully you can enjoy it like me. Thanks for reading! a chance for this manga to be animated EDIT: IT'S NOW FINALLY GOING TO HAVE AN ANIME!!! !